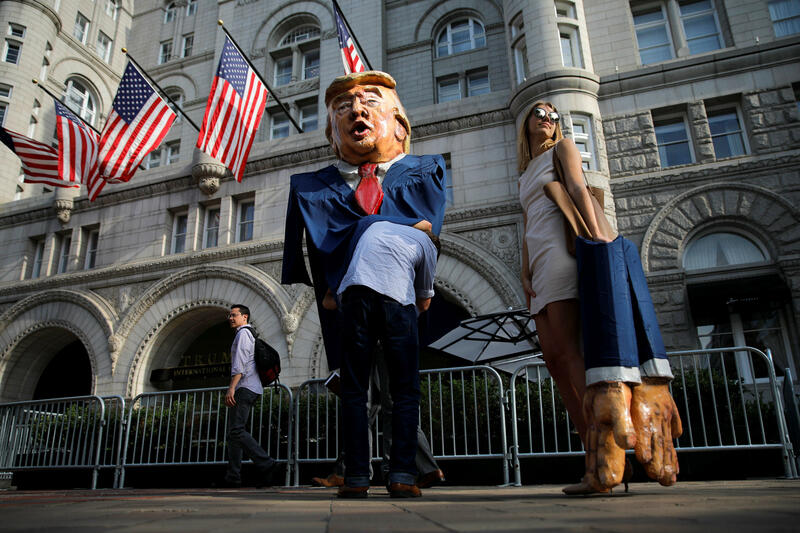 WASHINGTON -- White House reporters were shut out of covering what was billed as President Trump's first re-election fundraiser on Wednesday night at his Trump International Hotel in Washington D.C. Most of the money raised at the event went to the Republican National Committee. The White House decided late in the day to open the event to the press, only to rescind the decision an hour before the event, claiming "logistical concerns." Mr. Trump's motorcade -- on its way to the fundraiser -- was met by a group of protesters who chanted "shame" as the motorcade passed them. A Republican source told CBS News that the fundraiser is expected to pull in roughly $10 million dollar for the GOP. Individual donors forked up $35,000 to attend the event, and for $100,000 an individual scored a designation as a member of the host committee. Senior adviser Jared Kushner, First Lady Melania Trump, Speaker Paul Ryan, Secretary of Commerce Wilbur Ross, and advisers Omarosa Manigault and Kellyanne Conway were spotted by a GOP source mingling at the fundraiser pre-reception. Former President Obama kept some fundraisers closed to the press — of his 36 fundraisers in 2016, 15 of them were closed, and several of those were held at private homes, as opposed to public venues like the Trump hotel. However, tensions between reporters and the Trump administration flared this month, as the White House has limited access and reduced the number of briefings, with the majority of them being held off-camera. On top of acrimonious exchanges between members of the White House press corps and press secretary Sean Spicer and his deputy Sarah Huckabee Sanders, the president himself has aired his grievances with the press repeatedly on Twitter this week, tweeting false accusations of "FAKE NEWS" at media outlets like CNN and the Washington Post. Mr. Trump did not take questions on Monday during his appearance alongside Indian Prime Minister Narendra Modi and will not take questions on Thursday during a joint statement with South Korean President Moon Jae-in. A White House official could not explain to reporters Wednesday why the world leaders would not be answering questions at the joint appearances.